Aquatherm is a PP-R (polypropylene) piping system that can be used in many different applications. There are four different forms of Aquatherm piping. Aquatherm Green and Aquatherm Blue pipes are polypropylene pressure piping systems that can come with an optional faser-composite layer for improved pressure and heat ratings. The faser-composite also reduces the thermal expansion by 75%. Aquatherm Lilac and Aquatherm Black systems are non-pressure systems that can be used for gray water and geothermal systems, respectively. PP-R has excellent physical strength and high chemical purity, giving Aquatherm pipe quality and performance unmatched by other systems. Polypropylene pipes and fittings will not corrode or wear out over time. Aquatherm pipes are connected by means of heat fusion to eliminate leaks. 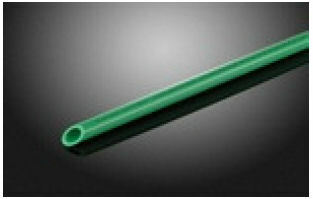 All typical fittings for thermoplastic piping systems are available. Sizes from 1/2" to 18"